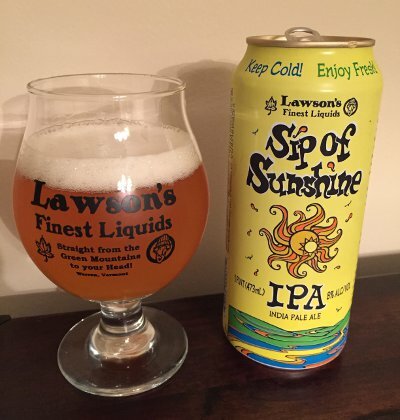 Recently though, it looks like Lawson's has established a flagship beer, a Double IPA called Sip of Sunshine that is planned to be available year-round. Yes, they really seem to enjoy drinking sunshine at Lawson's. To make this possible, Sean Lawson travels to Connecticut once a month to brew a very large batch at Two Roads brewing, packaging them in handsome 16 ounce cans for good measure. These seem to be much more widely available than anything else I've seen, and while I only picked up two 4 packs during my recent trip, I could have probably bought a full case if I wanted to. This is excellent news, though I'm really hoping that my triumphant return to Vermont in early July means I'll be able to snag a different bottle from Lawson's. Otherwise, I might just have to settle for more Sip of Sunshine. The horror! Beer Nerd Details: 8% ABV canned (16 ounce pounder). Drank out of a tulip glass on 6/12/15. Canned: 05/06/15. Fingers crossed that I can find some other variety of Lawson's on the forthcoming Vermont trip, but I certainly won't complain about scoring more of this stuff. This page contains a single entry by Mark published on June 17, 2015 9:49 PM. Trillium Double Feature was the previous entry in this blog. June Beer Club is the next entry in this blog.